For most people, even veteran Napoleonic Grognards, the “War of the Third Coalition” has three distinct parts. 1. Turning away from the aborted invasion of England, Napoleon takes his army on an astonishing force march, surprises Mack and much of the Austrian army at Ulm, and forces their surrender. 2. French capture Vienna, using sneaky tactics. 3. Big, decisive battle at Austerlitz. Austerlitz may have been Napoleon’s classic battle, in his own estimation. It was certainly one ‘title’ he refused to award to anyone else, though several of his marshals coveted being named “Duke of Austerlitz” or something. No, it was his masterpiece. But it was not the only battle of the war. And another one might have changed everything. While most of the French army is heading for strudel in Vienna, a newly slapped together corps - the VIII - is chasing the Austrians out of Bavaria, looking to snap up stragglers, loot, and also block anticipated Russian reinforcements from making it to the decisive battle for Vienna that Napoleon expected to fight. Newly created corps often have ragged organization, and such was the case here. While Marshal Edouard Mortier had an entire division of cavalry under his command, he allowed most of it to separate on its own mission and then allowed the tiny remnant to go adventuring also. In tactical terms, he was “blind” when he reached the town of Durenstein, perhaps most famous as having the castle where King Richard I had been held for ransom. 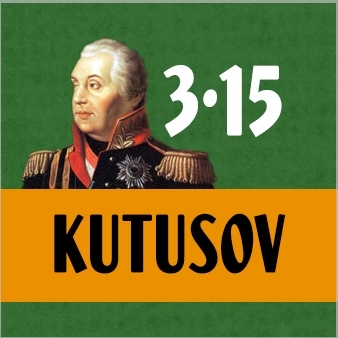 Leading a combined Russian-Austro army much closer than Mortier realized was the wily Marshal Kutuzov, who was neither blind nor overconfident. He saw the overextended enemy advance as a chance to strike a blow and suckered the lead division into a valley between two heavy Russian columns. Not only had Mortier lost touch with his cavalry, but he allowed his three infantry divisions to become widely separated as well. He was marching with his lead Division, under T.M. Gazan, into a situation that might have been known as the “Valley of Death” fifty years before a spot in the Crimea earned that title. Kutuzov did not have everything his own way, however, as the columns he wished to attack with were exhausted, starving, and freezing…hardly in condition to be launching an assault. But they did, in a battle that lasted for hours and on into the night. "We must not separate from these brave fellows; we must be saved or perish together!" Gazan (and Mortier) would certainly have “perished together” had not the nearest support, Dupont’s division, covered a day’s march in half the time. The battle sputtered on into a freezing cold night before the Russians finally withdrew, even more miserable than they had been at the start. Both sides claimed victory, but, with 60% casualties, Gazan wasn’t very thrilled at the outcome, though he may have felt better about it when awarded the highest Legion of Honor. Mortier’s reward was simply to be reassigned… although he would later have a distinguished career, both under Napoleon and the rulers who followed him, dying under bizarre circumstances that merit a story all their own. Now this hardly-known battle - fought three weeks after Ulm and three weeks before Austerlitz - can be yours to explore. Step into Mortier’s shoes, in a truly “Against the Odds” situation. When the battle starts, you are outnumbered 4-1 in infantry, 20-1 in guns, and “lots’ to “almost none” in cavalry. But Kutuzov has challenges too. His men are exhausted and hard to get into motion. These Brave Fellows comes complete with a 22” x 34” full color map, 216 9/16” full color, die-cut counters, charts, and only 10 pages of rules. Game mechanics cover the difficulties of coordinating attacks (and fighting in the snow), and variable arrival times of the Russian columns and supporting French. 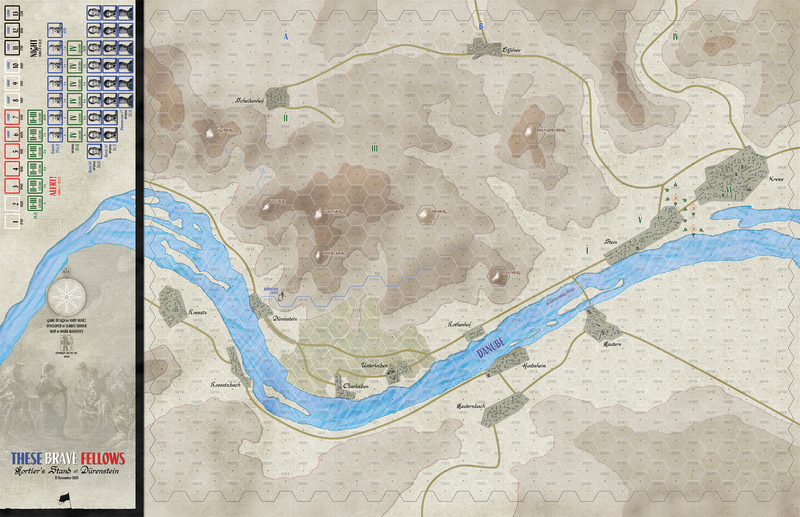 Optional rules allow players to explore the “what might have been” situations that were so close to happening - both sides had additional troops who could have been involved (or could have gotten there a lot sooner than they did). Can you, as Marshal Kutuzov, thoroughly smash the arrogant French and increase the shaky confidence of the Third Coalition? Can you, as Marshal Mortier, do better than “hold on” with the last few survivors and lower the battered Russian army ‘s morale even further? * Quoted from S. Bowden, Napoleon and Austerlitz. See the map for These Brave Fellows. Download the rules for These Brave Fellows (in PDF format).